Point of View: Interpreting the Francis Effect is a S+L series that goes deeper into the questions surrounding the person and pontificate of Pope Francis. The series consists of a selection of the full interviews from S+L’s original documentary The Francis Effect. Find the full schedule for Season 2 of POV here. Tonight: Cardinal Seán O'Malley, OFM Cap. Before and during the 2013 conclave there was much talk about the possibility of an American pope. As unlikely as it may have seemed at the time, we can now say with a degree of certainty that the American Cardinals at the conclave were, not only influential, but one of them in particular was getting a lot of attention: Seán O’Malley, the Archbishop of Boston. His authenticity, simple lifestyle and concern for the marginalized have set him squarely in the ‘Francis camp.’ It’s no wonder the Pope has brought the beloved Franciscan friar into his inner circle and is relying on him to spearhead some of the most important church reforms. Gomes: Regarding Pope Francis, a lot of people say, “the substance is the same, but the style is different.” I wonder, is it that, or is there something deeper going on? Is there a kind of radical transformation of the papacy taking place at this moment in history that goes beyond just the stylistic changes? Cardinal O'Malley: Well, the papacy is always evolving. Just in my lifetime: as a child it was Pius XII, and this was a man who took all of his meals in solitude and never left Vatican City. And when Pope John XXIII went to Assisi, this was revolutionary. And then Paul VI went to the Holy Land and addressed the UN in New York and went to Columbia. And then, of course, John Paul II who was probably seen by more people than any other human being in the history of the world. So there have been changes constantly. But with John Paul II I think there was this move towards a new, modern image of the pope, more engaged with the world as a whole. And in Pope Francis I think it's just more of a natural evolution that's taking place. And, of course, he's bringing to it his gifts, his personality, his experience as a Latin American. And he's a little freer from some of the weight of historical traditions and people are reacting to that, they feel very comfortable with that. Gomes: Do you think it would be possible, at least theoretically, for the changes Francis is implementing to be reversed in the future? 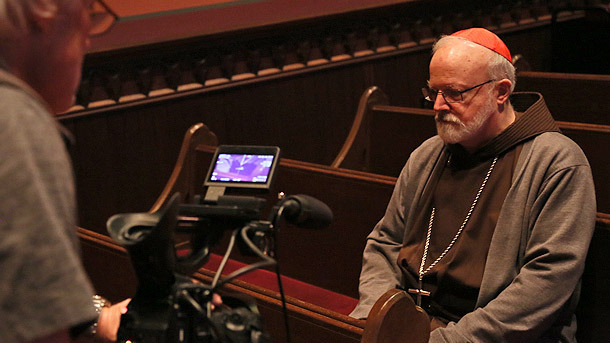 Cardinal O'Malley: I think that with the modernization of the papacy – I don't know – I can't imagine going back to some of the old ways of doing things. But every Holy Father will be different and have his own style and his own way of doing things. And so, if anything, Pope Francis has shown that the Holy Father can choose to do things differently and in his own way. And even Pope Benedict's decision to resign was very, very historic and will, perhaps, give popes in the future a greater freedom to be able to make a similar decision.